With Back-to-School just around the corner, this year my little guy will be eating lunch at school some days (hold on while I go sit in a corner and cry like this little girl). This means that I am on the search for any ways to make getting ready for school faster and easier, and anyways to make eating healthy fun and exciting. 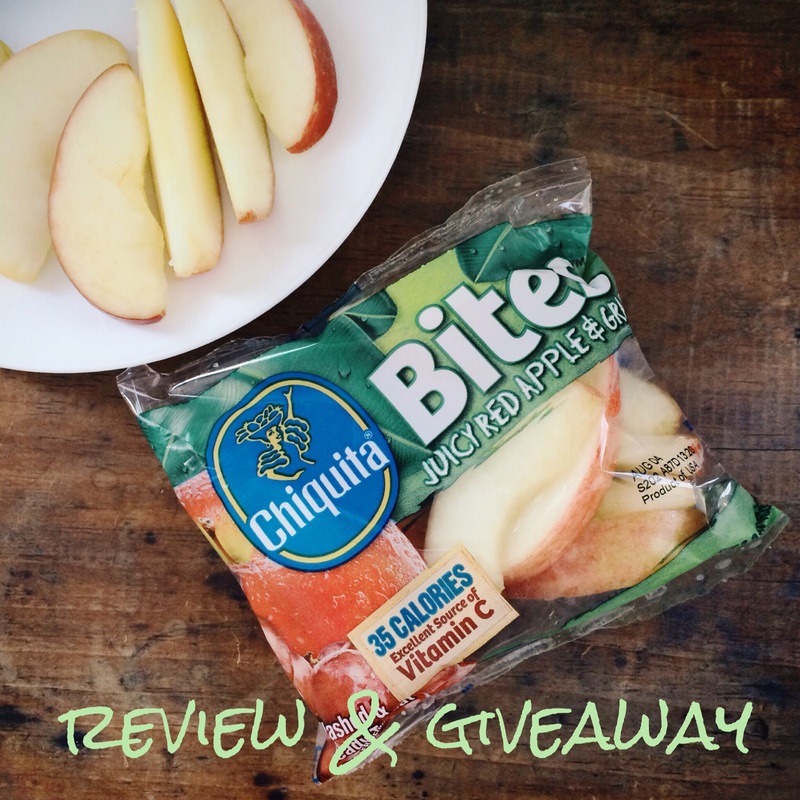 Just in time for Back-to-School, I was invited to review Chiquita Bites and to offer a special giveaway perfect for Back-to-School to our readers. Chiquita Bites are washed and ready to eat, come in a variety of sizes (single serve, multipacks and family size). They won’t turn yucky brown before you kid gets to eat them. Are great for lunches, salads and recipes. And let me say it again- they are washed and ready to eat! Why am I repeating this? Well if you are like me, sometimes the only thing in your fridge that is washed and ready to eat is chocolate. Having something that is healthy and low calorie to snack on is not just great for the kids in the house, but for the adults too. Don’t get me wrong we love to cut apples when we have time– see my son at two cutting apples here, but sometimes we would rather get back to playing. How did Chiquita Bites fair with my son? Well let’s just say thanks to the single serve size pack Juicy Red Apple Bites with Caramel- he ate the bark (that is what he calls the peel of the apple)!!! Mom does a happy dance. And want to do another happy dance for those non-bark, I mean non-peel eaters, Chiquita Bites comes in single serve Peeled Apple Bites! Mom’s around the world rejoice! Here are some pictures of apple eating in action. 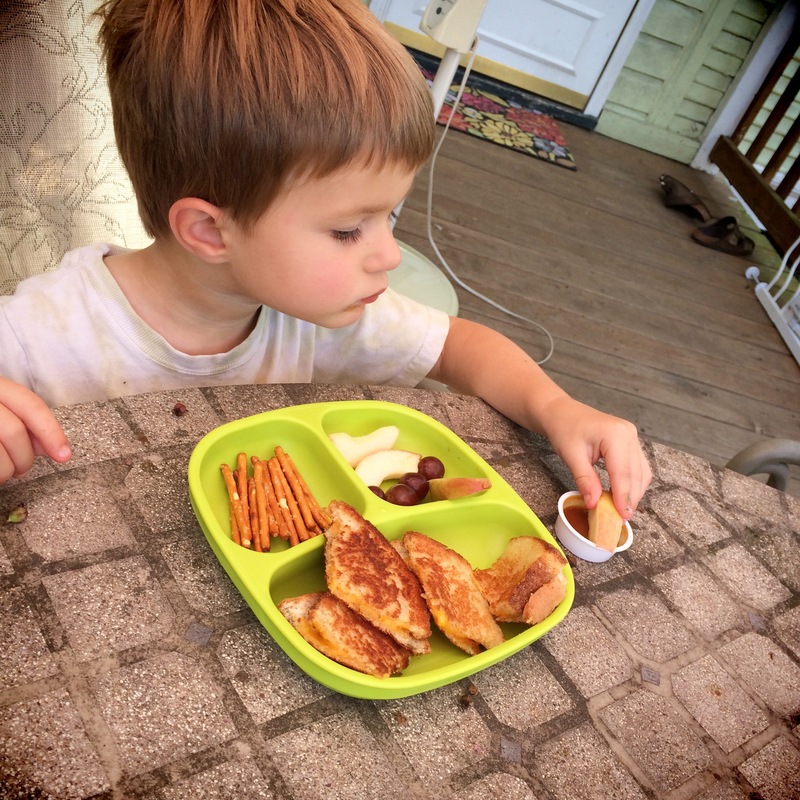 Picnic outside- Juicy Red Apple Grape Bites and Juicy Red Apple Bites with Caramel. He was devouring the apples with carmel! I am excited to offer to my readers a Thirty-One Thermal Tote as a giveaway. 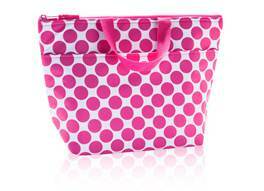 This Thermal Tote is perfect for taking lunch on the go or to keep drinks and snacks cold while you’re out and about. It is the perfect addition to any mom’s Back-to-School collection! Please note that actual pattern may vary. Giveaway open to US residents 18 years and older. I received this product for free from the Chiquita. I agreed to use this product and post my opinion on my blog. My opinions do not necessarily reflect the opinions the manufacturer of the product. Hi! What always saves me time is to have a clear plan as to what I need to buy. I make lists, look up deals, and plan exactly where I’m going to buy everything. I try to buy supplies in one trip and clothing in another. By planning, I can do it al in two trips. Thank-you!! I just buy a lot of the necessities online. I really don’t have any time saving tips. I’m sorry. I have three back to school kids, ones 7, ones 11 and ones 12 and their all so excited to go back in 22 days!! I think planning ahead is the best way to save time. My child does not back every day so keeping track on the calendar is a huge help. Being prepared when I go to the grocery store lets me buy well-balance lunches that make me happy and my child too. My back to school time saving tip is to get the kids involved in activities each night like packing their own schoolbags and lunch, laying clothes out the night before and set my phone to alert me to pick up and drop off times for school and activities. I take the flyers from the paper that have a discount and we hit those stores and get the minimum we need to buy to use them. Drop off any school supplies required by the school early if possible. Don’t overload the little one on the first day, and most of all organize at night. I always plan everything in advance as far as buying the backpacks, clothing, school supplies, etc….